Chief Polin, who championed saving the Presumpscot River, had walked to Boston to make his case. WESTBROOK — For centuries, indigenous people lived undisturbed in the area between Sebago Lake and Casco Bay, their livelihood tied to the Presumpscot River and its bounty of salmon, bass, trout and other sea-run fish. When Col. Thomas Westbrook, who later had a city named after him, and other European settlers built dams on the river in the 1730s to help power paper mills and gristmills, the fish stopped running. 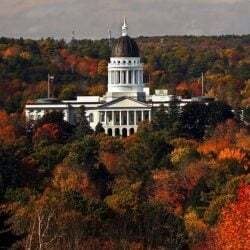 The major food source of the Abenaki people was threatened. The tribal leader, Chief Polin, didn’t surrender quietly. 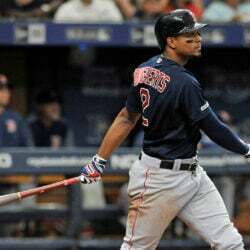 He twice walked to Boston – Maine was still part of the Massachusetts Bay Colony then – to persuade the Colonial governor, Jonathan Belcher, to intervene and order the mill owners to install a fish passage. Belcher said he would but it never happened. Polin eventually armed his people to fight for access to something that had been theirs for generations. He was killed in 1756 in what is now the town of Windham by Stephen Manchester, an early settler who is still recognized as a hero for ending what had been a drawn-out conflict. Not long after Polin’s death, his people either retreated or went into hiding. 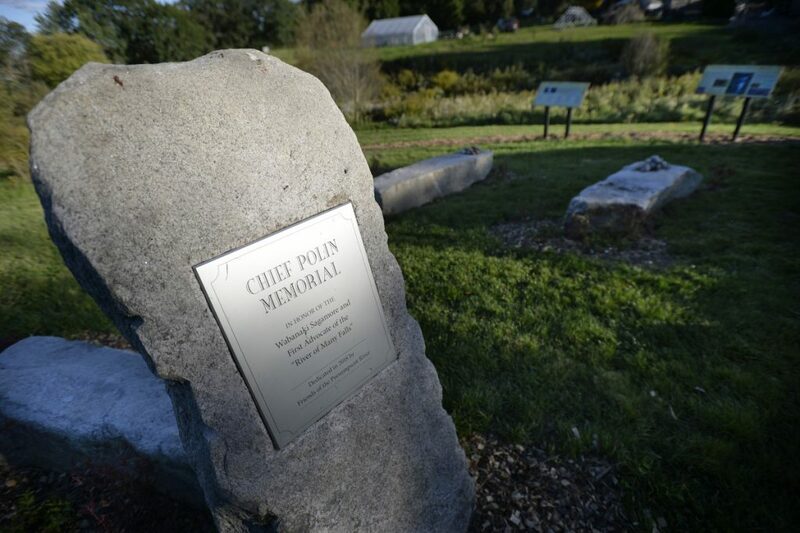 The Presumpscot, which means river of “many falls,” still runs through the area today, yet there is nothing that signifies Chief Polin’s place in its history. Michael Shaughnessy and others with the nonprofit Friends of the Presumpscot River wanted to change that. 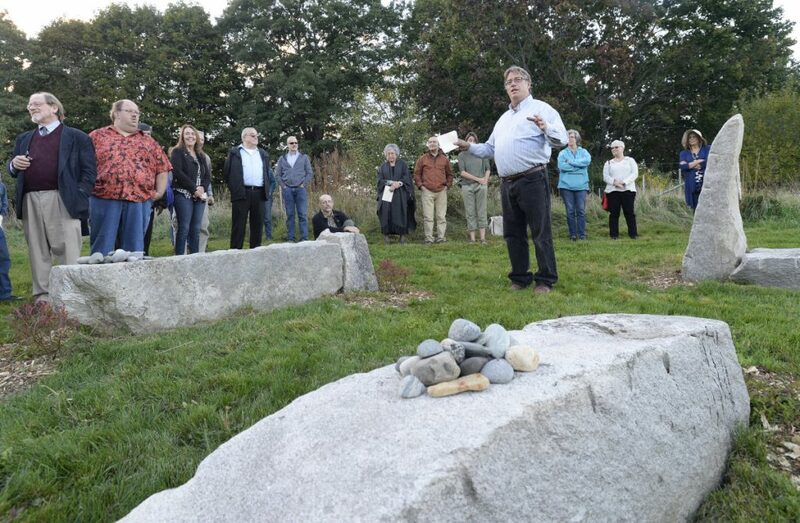 On Saturday, before a crowd of about 75 people, Shaughnessy unveiled a memorial to Polin – a massive stone marker with a plaque bearing his name, along with four additional granite slabs to signify the four native tribes still active in Maine and a set of informational boards that detail Polin’s and the river’s history. The monument sits on the back edge of Shaughnessy’s property on Conant Street, not far from the Presumpscot River where Polin and his people used to fish and where they planted corn, beans and squash near its fertile banks. It will be accessible to the public from the Conant Trail, a part of the Portland Trails system near Saccarappa Falls that connects to Main Street in Westbrook. Shaughnessy said it was “stunning” that Polin had not been recognized publicly in more than 250 years. Michael Shaughnessy, president of Friends of the Presumpscot River, speaks during the dedication of the memorial garden Saturday. “This is a living memorial. 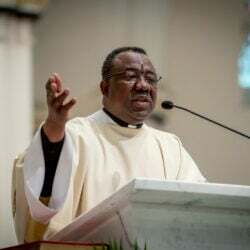 It’s going to change and grow with time,” he said, encouraging those in attendance to pick up small stones that were gathered and set them at the base of the monument to mark that they were there. Westbrook Mayor Mike Sanphy, who also serves on the local historical society, said Polin is a great part of the city’s history, but sadly one that has been “lost to obscurity.” He praised the efforts of Shaughnessy and others who made the memorial a reality. Indigenous people have long been underrepresented in history books, although that is changing. Shaughnessy said much of what has been learned about Polin has come from research by Lisa Brooks, a Native American historian and professor at Amherst College who attended the memorial unveiling and was recognized for her efforts. “She gave our mission a depth we never could find,” Shaughnessy said. 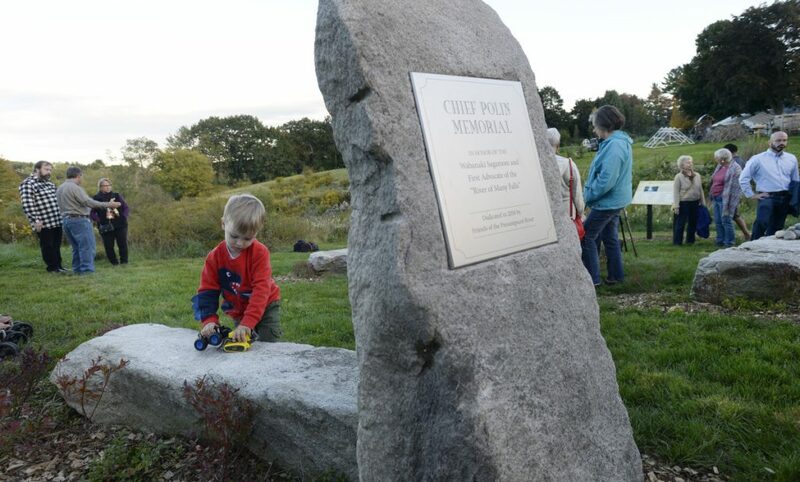 The memorial garden to Chief Polin on a section of Portland Trails at The Farm at Conant Homestead in Westbrook on Saturday. 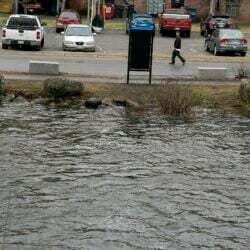 The river is still being fought over. The Friends of the Presumpscot River have been working since 1992 to improve water quality and, eventually, to remove dams and restore native fish to the waterway.